Army Navy is one of the greatest American college football games. Within this fierce rivalry, stretching over 100 years, a new tradition has emerged. Army and Navy both enter the national showcase event wearing special uniforms that showcase their honored and unique histories. 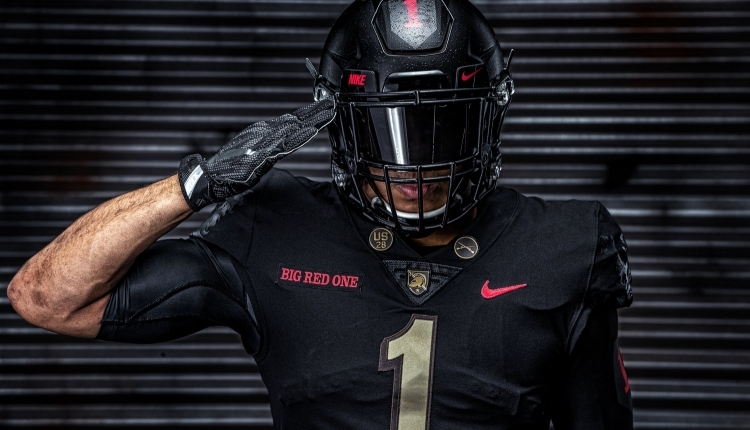 Nike has honored the Army’s legacy for the past three years, working with historians at West Point to develop meaningful kits that have led to victory over Navy. The past three years has seen Army honor Divisions of the United States Army with their uniforms; 2016 was the 82nd Airborne, 2017 was the 10th Mountain, and this year is the 1st Infantry. These uniforms are iconic and well-designed. They are highly sought after by Army fans and Veterans alike. Both the current year’s merchandise, as well as the merchandise for the 10th mountain, featured jerseys that were sold out in a matter of a few hours. There was no option to buy them again after the first run. Army fans have collectively voiced the desire for high quality versions of the jerseys available (with sewn on numbers and patches, like the 2016 jersey featuring the 82nd Airborne). West Point women graduated also feel frustrated at jerseys not being offered in womens sizing. Army fans and veterans alike would love to support our team and divisions with these jerseys. We are hoping with this petition we will be able to purchase the jerseys that saw West Point earn the Commander-in-Chiefs trophy for the first time in over 20 years. There is no substitute for victory! We, the undersigned, call for Nike to release a higher quality version of the divisions jerseys that have been made for the Army Navy games. This would mean the making of jerseys with sewn on numbers and patches. In addition to this the inclusion of womens sizing would help to expand this merchandise into being more accessible to half of the population. The West Point's Army Navy Jersey to be re-released by Nike petition to Nike was written by Michael Murray and is in the category Football at GoPetition.